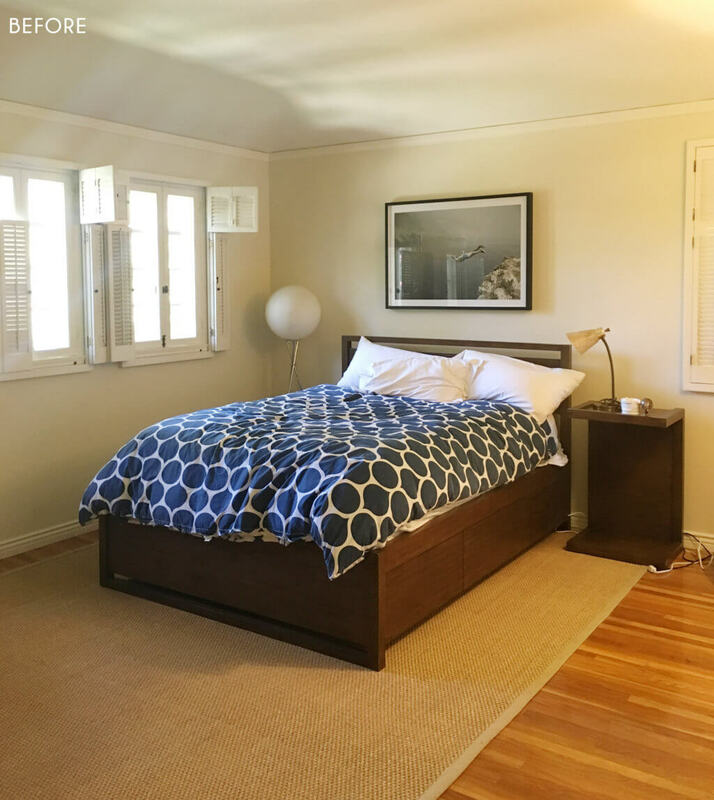 Hey all, it’s Ginny again with another intro post to the Los Feliz house we’ve been working on. 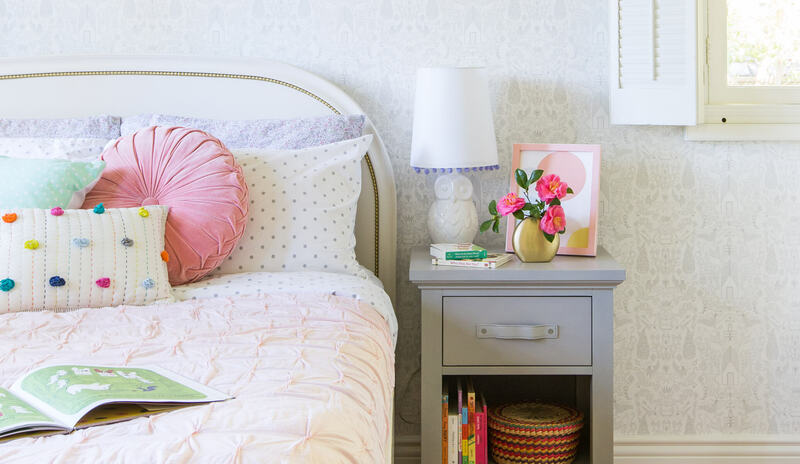 They wanted to slowly update the rooms in their home, so we started with their guest bedroom, playroom, and now their daughter’s big girl bedroom – all of which will be revealed in the coming weeks. 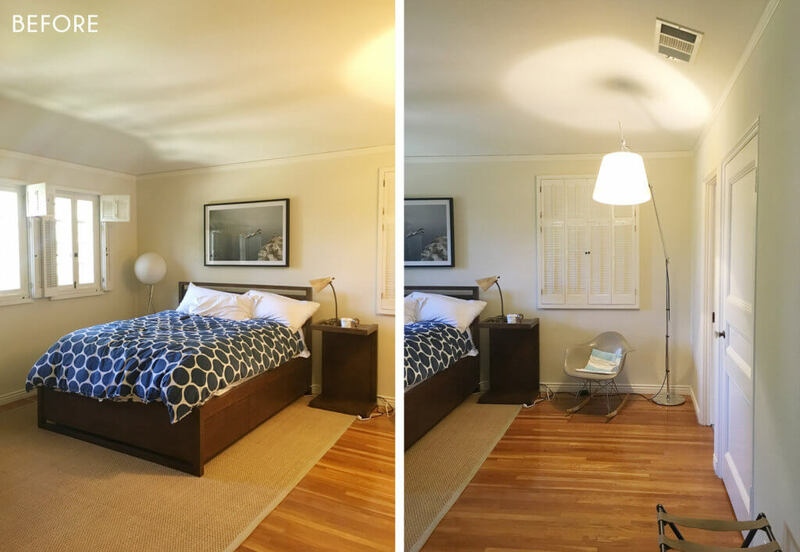 This room was originally another guest bedroom that connects to the nursery via a ‘Jack & Jill’ bathroom. 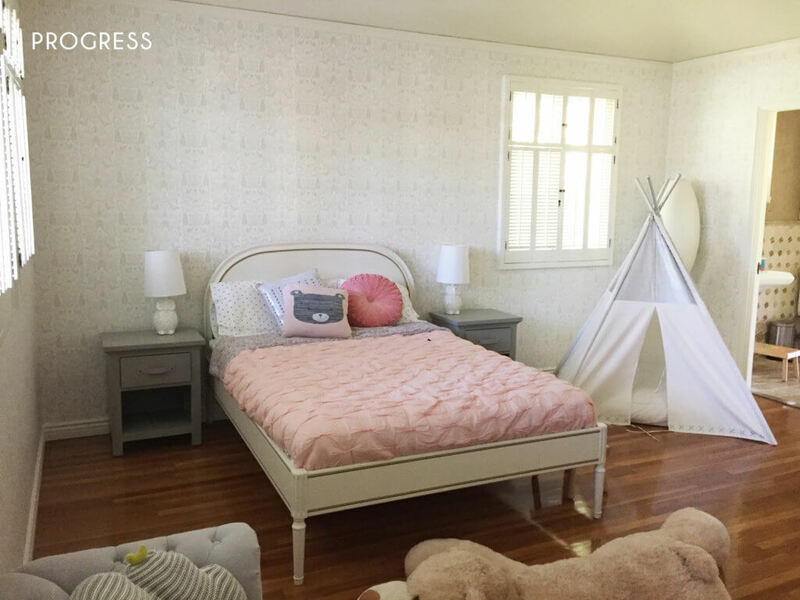 With another baby on the way, they wanted to transition their toddler from the nursery into a big girl bedroom that she can grow into. They didn’t want to keep any of furniture in here so this all got moved to another guest bedroom (there are 3 in the house). The shutters were in really good condition and original to the house so we knew we wanted to keep those (you’ll see from the moodboard options below that we suggested adding curtains. We ultimately decided against that once we started to install everything else). 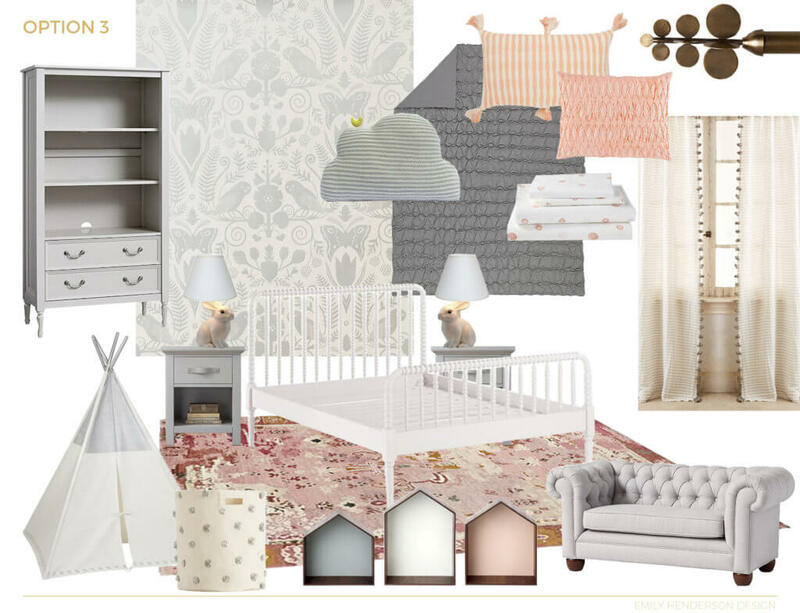 The inspiration images they showed us reflected a Scandinavian type vibe that felt sophisticated, yet still playful, for a growing toddler. They also wanted to keep the color palette fairly minimal and neutral. We pulled together a few different options switching out the wallpaper, bed, and rug to give the clients some variety. 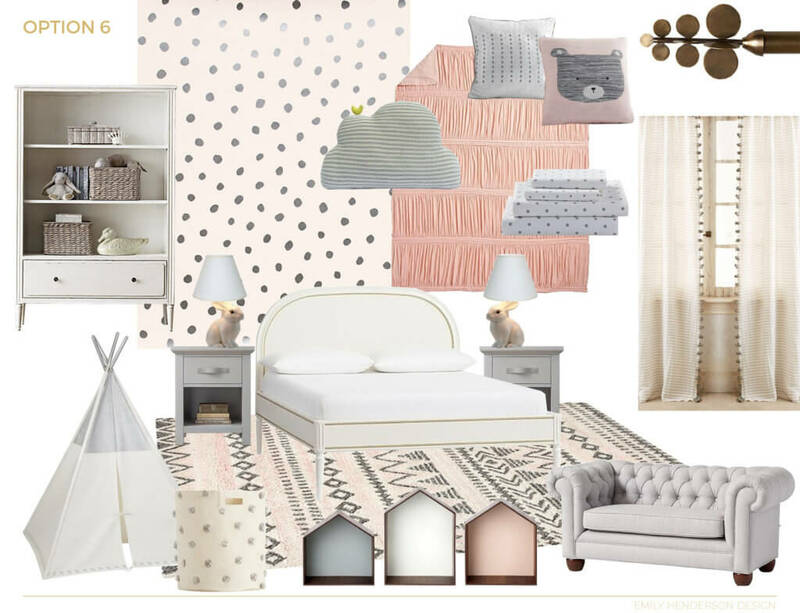 We kept the color palette to light grey, soft peaches, and dusty pinks. 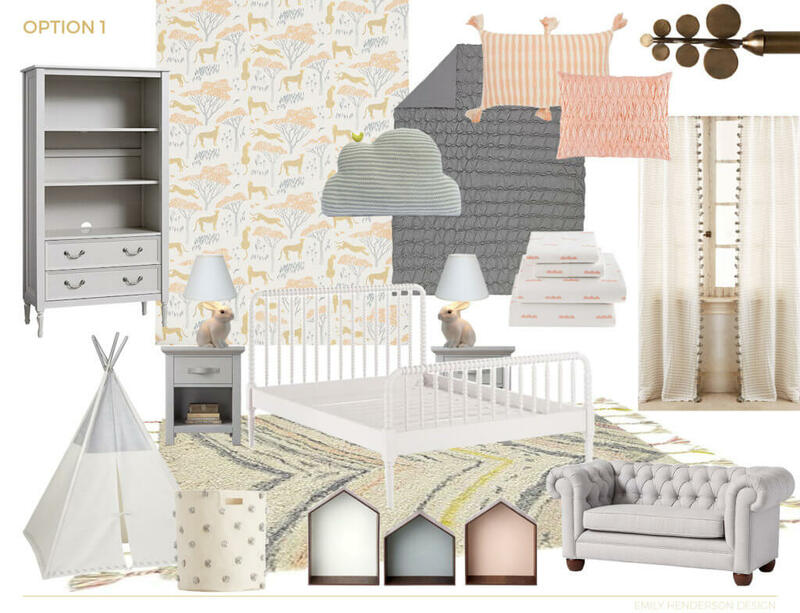 They already had the teepee from Land of Nod and wanted a cute settee for cosy reading time. They also wanted to do a full bed for her to grow into, as she was already in the process of transitioning from her crib. We were psyched that they also wanted to do a wallpaper in here and we picked out a few really sweet options. This one above is from Hygge & West and is so cute in person – we really championed for this one, but they wanted to keep it less colorful than that. 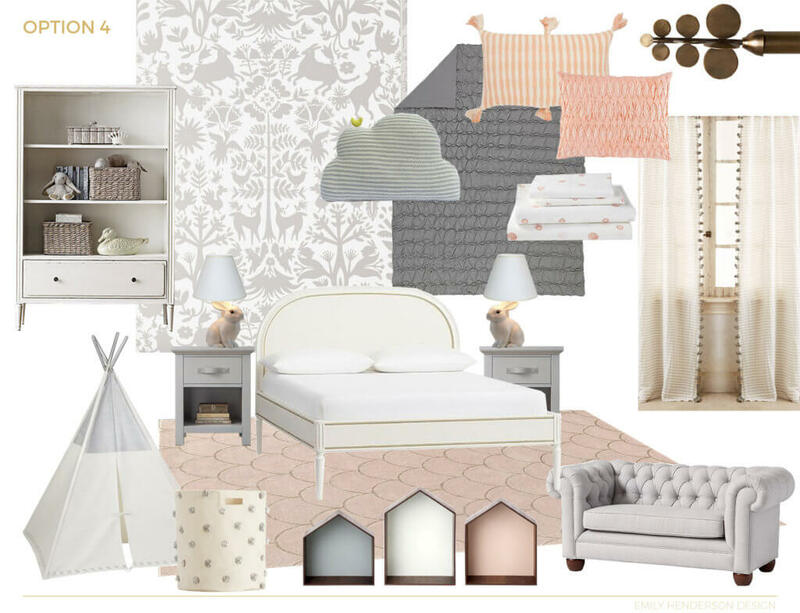 Aside from accessories and artwork this is pretty much the final furniture moodboard. 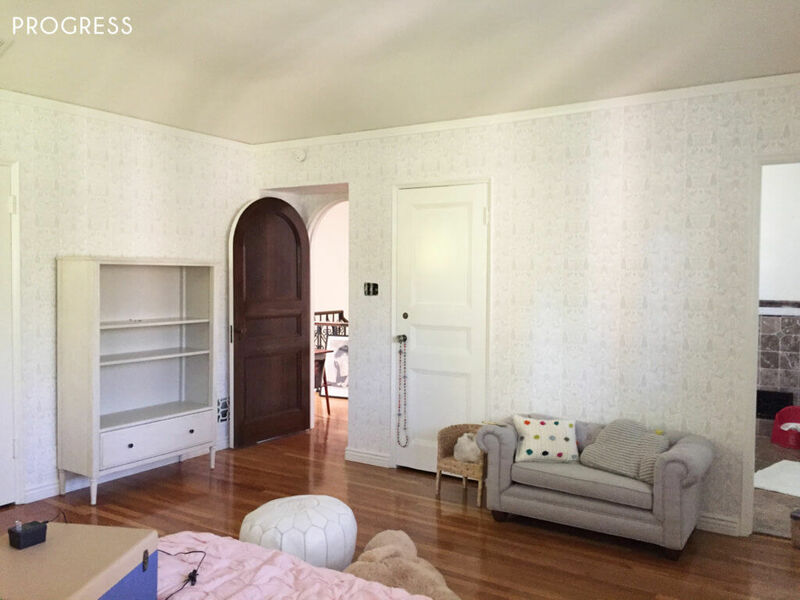 This is the Hygge & West wallpaper installed – it’s really adorable and gives a nice feel to the room without being overbearing, since the pattern is rather busy. We ended up ordering the roll arm sofa, but the client didn’t realize it was more for kids than adults. They really loved the idea of being able to sit on the sofa together and read with her, so we swapped it out for the one below. 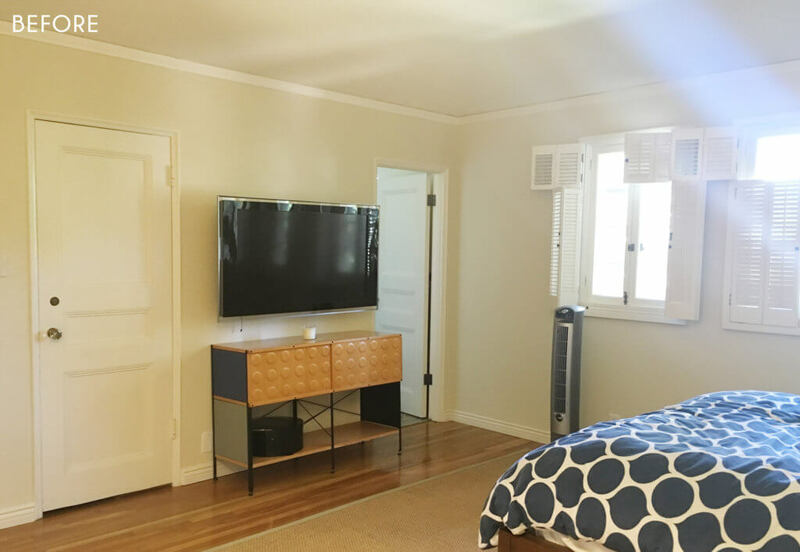 Aside from the wall where the bed is, there isn’t a lot of blank space to add more furniture. We maximized on what was available with the sofa, and added a bookcase for storing toys and books. This is the sofa we went with, and while the two tone fabric is kinda fun the dark grey felt too heavy in here. We had some of the pink linen fabric leftover from the playroom sofa we reupholstered so we had the seat cushion reupholstered (you’ll see in the final reveal). 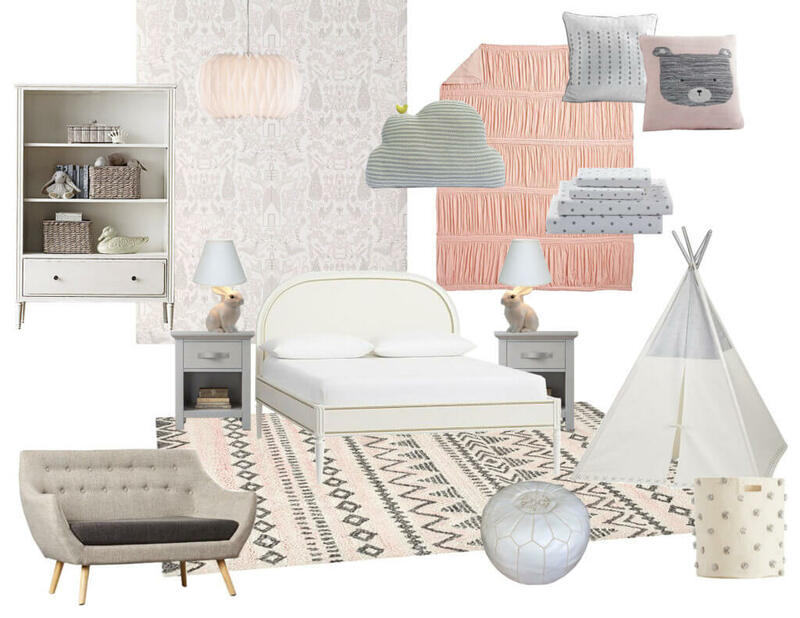 We absolutely love this bed from Pottery Barn Kids. It has a real vintage feel to it, which is why we were all so drawn to it. 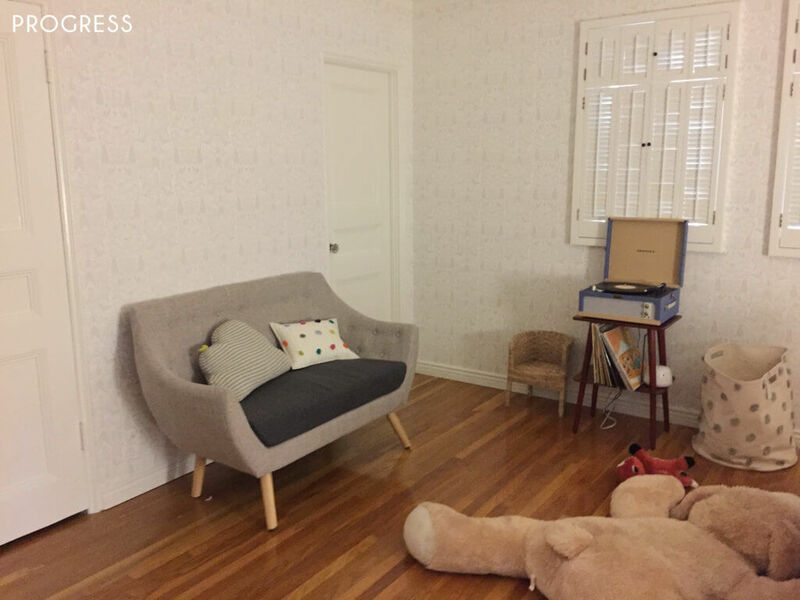 With their being such a time crunch on this room we didn’t include any vintage pieces. Even though vintage is often cheaper it can actually take a long time to source the perfect piece – which is not ideal when dealing with quick deadlines and budgets. And here is a sneak peek. I’m sorry, I know that we’re really teasing with these posts but I promise you the reveals will be brilliant! In the meantime, let us know if you have any questions below.